If you are interested in getting involved in our affiliate programs, the first thing you have to do is decide wich collection do you want promote, ISOTYPE, Icon or OpenCity. The affiliate is tracked across all pages on the collection. If the customer visits any other page on the collection and purchases, you will receive a commission. Becoming an affiliate is relatively easy. Go to the affiliate pafe of each collection and fill out an online application to become a member. The application will ask for some personal information (name, address, payment method) and information on your site (URL, name, and description of content) and will have you agree to a service agreement. Once you will register, become affiliate, and automatically be assigned a unique affiliate ID. You’ll be able to use affiliate referral URLs which include your unique ID to promote illustrastock.com website or products through their mailing lists or social accounts – but they must link back to the site. When a customer clicks on the affiliate referral URL, they’ll be linked to illustrastock web site and a cookie will be stored in their browser. This is how the system knows which affiliate referred a customer. Depending on your chosen integration, when the customer successfully purchases one of our products, a membership, or submits a form on illustrastock.com website, a referral will be created for the affiliate who referred them. Let me know if I can help you with any other questions! The affiliate should receive commission on all the purchases up to the cookie expiration date. We’ll provide you with logos and display ads to use on your site. View up-to-date data on your program and performance. When a customer clicks this link and lands on your website, the affiliate’s ID (123 in the example above) is stored in a cookie, within the customer’s browser. If the customer makes a purchase, the affiliate that the customer is tracking is awarded commission on the sale. The cookie’s expiration is 180 days (+- 6months). We offer 20% of commision rate for each sale. Can affiliates credit the last referrer? Yes! There is a checkbox on the settings page. 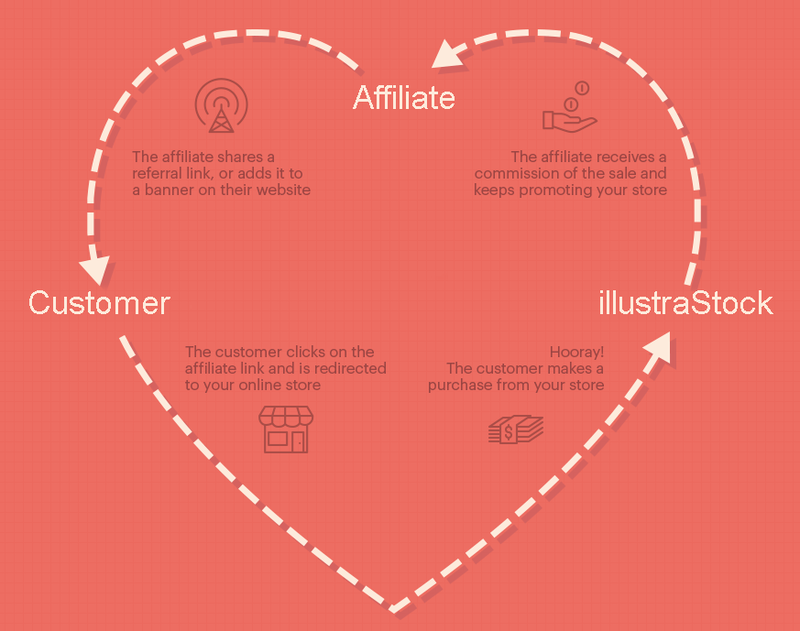 Can affiliates refer themselves and earn commission on their own purchases?